SUMMARY: To capitalise on a digital strategy, media companies are partnering with their competitors to maximise on capabilities and data. It is a well-known fact that, in the transition to digital news publishing, news publishers have lost control of the news production and publishing value chain. But let’s face it: Most, if not all, of us are still struggling to fathom — let alone find — effective strategies to navigate the new paradigm in news publishing. A recent report from the Danish Ministry for Culture provides a new view into our new reality. A disclaimer: I didn’t just stumble across this research. I helped carry it out while also while working at JP/Politikens Hus, and it has informed the business strategies we have used to develop Ekstra Bladet into Denmark’s largest digital news publisher measured on page traffic. Back in the day, paper and ink (along with news stories and advertising) were the core resources used to produce print newspapers. These were, in turn, distributed to subscribers and newsstands via trucks on roads. Large- or medium-sized news publishers often controlled most of the steps in the value chain, either fully or collaboratively with other news publishers. Today, multiple direct and indirect business partners participate in and are essential for producing our news offerings. We call them third parties, and they produce resources integrated into our news offerings in real time, enabling all sorts of good things. These good things include the sharing of stories on social media platforms, news content personalisation, targeted ad serving, interactive maps in news stories, pretty fonts, and more. In a sense, the digitised social-sharing widgets and ad tech stack we rely on today are analogues to the paper and ink of the print era, while trucks, roads, and traffic lights are analogues to ISPs, search services such as Google, and social media platforms such as Facebook. Take Ekstra Bladet. In a single page load of our Web site, on average more than 25 different firms supply assets such as widgets, ad tech, and analytical tracking tools. Looking across 500 page loads, more than 150 firms deliver different types of digitised resources. In return, Ekstra Bladet pays via tech fees, shares of advertising revenues, and flows of user data that some business partners use to power their offerings or sell to yet other firms that do so. 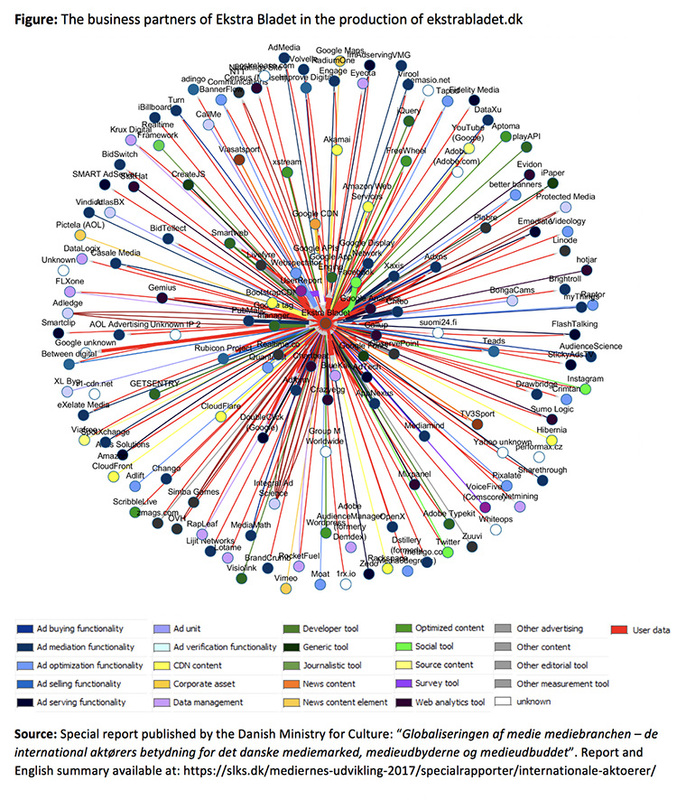 This vast network of firms and flows of different types of resources and user data to and from Ekstra Bladet (as well as of 15 other Danish news publishers) was mapped in the report published by the Danish Ministry for Culture, illustrated below. Dozens of partners help power Ekstra Bladet’s online site. This mode of production, naturally, is not unique to Ekstra Bladet or to Danish news publishers. The same dynamic applies to all major American news publishers with a B2C focus. Research from 2016 illustrated The Wall Street Journal, Huffington Post, SFGATE, and BuzzFeed had a direct or indirect collaboration with between 124 and 257 business partners that delivered between six and 16 resources of different sorts, and that between eight and 15 different firms per pageview placed cookies enabling user data collection. 1. We are now dependent on a large number of business partners when we produce and publish news. These business partners most often provide resources that make our news offerings better for users, advertisers, and us, the news publishers. At the same time, these business partners all capture part of the value generated by a news publisher, and their actions are beyond our direct control, creating new strategic dependencies. The former costs a lot of money while the latter makes us vulnerable to the whims and fancies of our new business partners and their shareholders. 2. We are now engaged in co-opetition at its most extreme. Often the digital business partners we collaborate with are also our competitors. They provide us with valuable resources while at the same time rely on money and user data from us to improve their own offerings to their users and advertisers competing with us for time and ad spend. In doing so, some of our partners create and leverage strong network effects by collaborating with many news publishers, making the competitive part of co-opetition much stronger than originally described by Adam M. Brandenburger and Barry J. Nalebuff, who first popularised the term in the mid-1990s. Without a doubt, the most extreme example of this is Alphabet, whose services are used by most news publishers and touch everything from search-based traffic flows to advertising infrastructure to the geographical maps we embed in news stories. According to the report from the Danish Ministry for Culture, a business unit owned by Alphabet places on average 2.8 cookies per pageview generated across the 15 largest Danish news publishers, far more than Facebook (the runner up) at 0.8 cookies per pageview on average. 3. User data flows are part and parcel of the new paradigm. User data flows are essential to the way news offerings are produced in the new paradigm, as they power everything from “like” buttons to ad targeting to content personalisation. We can make contracts with some our business partners to regulate what the user data they collect via our Web sites and apps may be used for. We can seek to control our own programmatic advertising ecologies via whitelists or blacklists of advertisers, ad networks, and ad tech providers. Similarly, policy makers can seek to regulate and instill some user control with initiatives such as GDPR in the EU. But as long as we depend so extensively on resources from third parties, user data will keep flowing, data leakage is de facto impossible to control, and flows of user data will keep powering the network effects that make firms such as Google and Facebook so incredibly strong. Creating a first-party data infrastructure may counter this in theory. But realising the radical first-party data strategies we all currently dream of — and that some interpretations of GDPR necessitates — entails a radical rethinking of our news offerings.